​ ROANOKE – Bluff City Group, in partnership with Peabody Hotels & Resorts and the City of Roanoke, plans to build a 300-room hotel on Oak St. 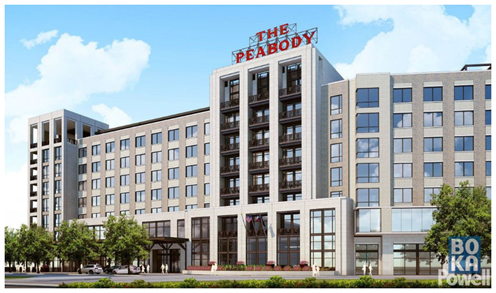 The Peabody Roanoke will be a full-service hotel and conference center with many of the same amenities found at the flagship hotel in Memphis. ​That will include Feather's Spa location on the rooftop like Duck Palace housing the world-famous Peabody marching mallard ducks. Roanoke Mayor Scooter Giersch announced the addition to the city’s growing downtown area June 29 at the Roanoke Community Center, within blocks of the new hotel’s planned site. Plans are to open The Peabody Roanoke by 2019. It will be located adjacent to Roanoke's new City Hall. Initial plans include 300 rooms and suites and more than 30,000 sf of flexible meeting and event space. Among the other amenities featured in the eight-story hotel will be a restaurant, two bars, a fitness center and a large rooftop swimming pool. ​Want more da​ta? See DFW Hotel Market Research.